In the circuit diagram LEDs D1 toD10 displays the level of the battery in either dot or bargraph mode. Resistor R4 connected between pins 6,7 and ground controls the brightness of the LEDs. Resistors R1 and POT R2 forms a voltage divider network and the POT R2 can be used for calibration. The circuit shown here is designed in order to monitor between 10.5V to 15V DC. The calibration of the circuit can be done as follows. After setting up the circuit connect a 12V DC source to the input. Now adjust the 10K POT to get the LED10 glow (in dot mode) or LEDs up to 10 glow (in bar mode). Now decrease the voltage in steps and at 10.5 volts only LED1 will glow. Switch S1 can be used to select between dot mode and bar graph mode. When S1 is closed, pin9 of the IC gets connected to the positive supply and bar graph mode gets enabled. When switch S1 is open pin9 of the IC gets disconnected to the positive supply and the display goes to the dot mode. With little modification the circuit can be used to monitor other voltage ranges. For this just remove the resistor R3 and connect the upper level voltage to the input. Now adjust the POT R2 until LED 10 glows (in dot mode). Remove the upper voltage level and connect the lower level to the input. Now connect a high value POT (say 500K) in the place of R3 and adjust it until LED1 alone glows. Now remove the POT, measure the current resistance across it and connect a resistor of the same value in the place of R3. The level monitor is ready. 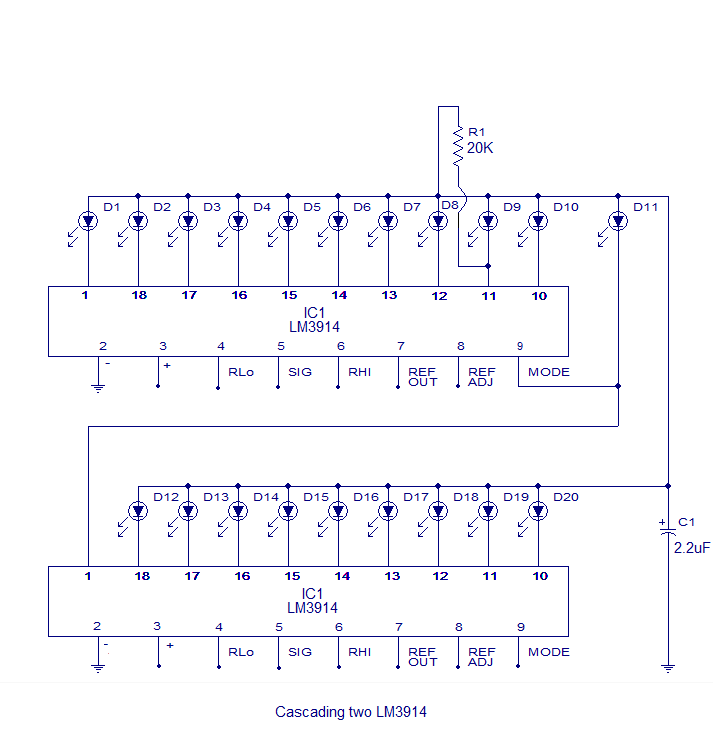 Two or more LM3914 ICs can be cascaded together to get an extended display. 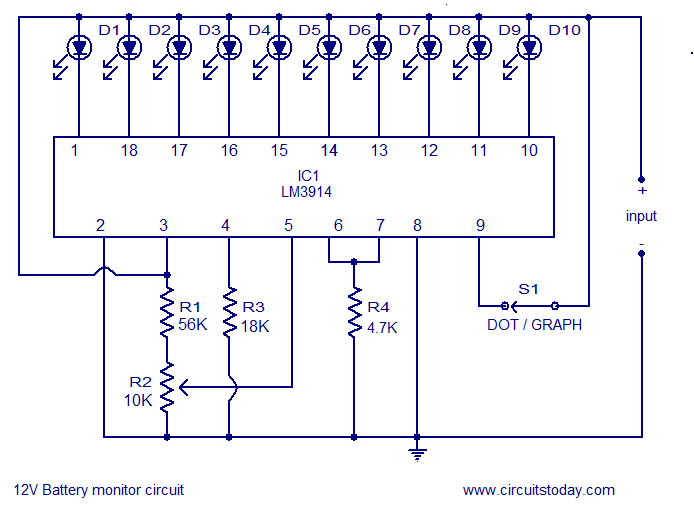 The schematic of two LM3914 ICs cacaded together to get a 20 LED voltage level indicator is shown below.